Prepare the cookie shape cutters you will work with. On clean working surface, using hands, combine flour, baking powder, salt, sugar, corn starch, butter, egg yolks, sour cream and milk. Knead to get smooth dough. Half it and add cocoa powder to one of the halves. Lightly flour clean working surface and separately roll both of the doughs to be 3 mm thick. Cover the baking pan with baking paper. Cut the shapes according to your taste. Simply insert the smaller shapes into the larger. No extra sticking necessary. 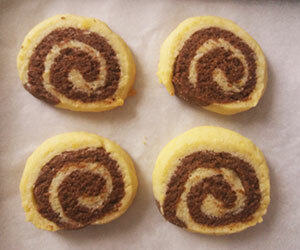 Place the cookies on the baking paper and bake for 7 – 8 minutes. 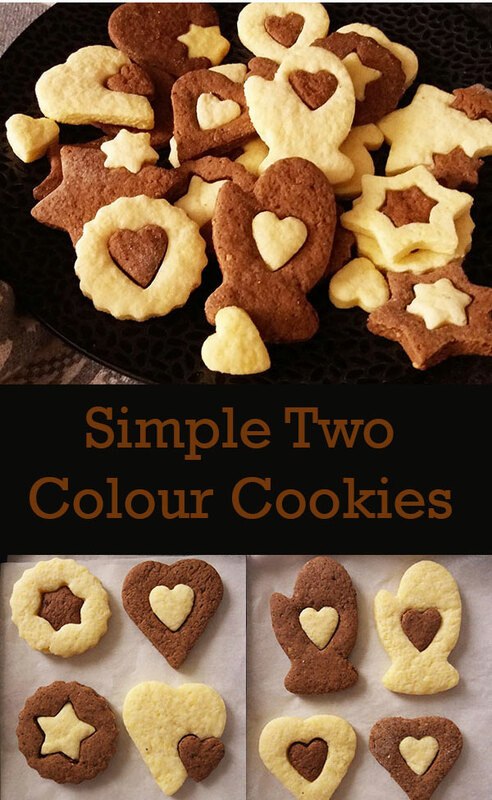 16 Responses to "Simple Two Colour Cookies"
They are simple yet stunning! I love it! Always happy to see your comment Angie ! Thank you so much ! I adore the mittens! What a fab holiday cookie! These are so, so cute! And it looks like a recipe I can’t mess up! Haha! Thanks for sharing it. Of course you cannot mess up; once you start, you experience the joy of baking, trust me 🙂 Thank you for commenting ! These are so cute! I especially love the mittens… However, the swirled spiral version reminds me of got at the Watergate pastry shop with my parents when I was a child… I think I will make those! What fun. The two-color cookie is very popular here for Christmas as well. The chocolate swirl cookie is likely my wife’s favorite. Also, thanks so much for the eggnog recipe. I haven’t seen a cookie like this in a long time. My grandmother used to bring things like this home from the bakery. Glad these bring nice memories back. Thank you Jeff. These are darling cookies. Can food be darling? I think so. 🙂 I’m sure they’re super tasty too. I especially love the one with the little heart half on half off the big heart. Oh yes: super darling and super tasty 🙂 Thank you Valentina. These cookies are adorable! So creative! And perfect for Holiday treats. 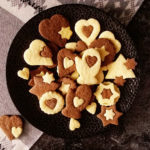 I love a simple recipe, especially when it makes impressive-looking cookies. So thanks, and pinned!